As of February 6th, there were 25 children undergoing cancer treatment at Children’s Hospital who desperately needed toys and means of entertainment while experiencing this trying ordeal. On March 13th, 180 toys were carried into Children’s Hospital by twenty remarkable high school students. For four weeks, the Lolo’s Angels Junior Board members collected toys from their parishes, teachers, friends, and family to donate to children at Children’s Hospital for the Junior Board’s annual Snow Day Toy Drive. This event was a beautiful reminder of the positive change we can affect within our community. One Junior Board member, Ellie Rommelfanger, a senior at Marian, singlehandedly conducted toy donations at her parish for three weeks and collected over 30 toys. Additionally, individual members of the community helped make the Lolo’s Angels Toy Drive a success in astonishing ways; the O’Kane family, members of the Saint Margaret Mary parish in Dundee, contributed 80 toys themselves. 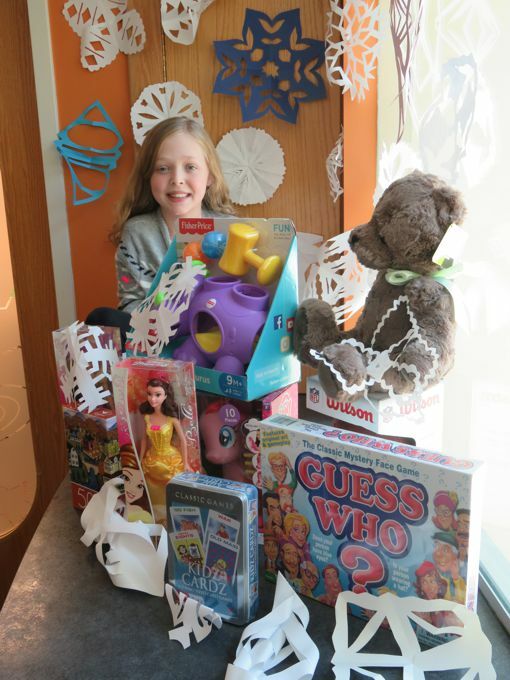 The Junior Board decided to collect and donate toys in late February and early March because children undergoing cancer treatment at this time of the year are often left without toys or means of entertainment; many toys come in at Thanksgiving and Christmas, but by February, March, and April the hospital’s supplies are severely depleted. The number of toys raised by these fantastic students and donated by generous members of the community fully stocked patient’s rooms, the outpatient treatment area, and the reserve supply of the cancer ward at Children’s Hospital. The Junior Board would like to thank everyone who helped promote this event. We are deeply grateful to everyone who donated to this cause. Please consider donating in the spring of 2018 to help make a difference in the lives of those afflicted by cancer. On behalf of the patients we are honored to serve at Children’s Hospital & Medical Center, we would like to thank you, Lolo’s Angels, members of the Junior Board of Lolo’s Angels, and everyone from the four schools and/or parishes who participated in making the February toy drive such a meaningful event and great success. We appreciate you brining cheer to the patients we’re honored to serve and we appreciate you raising awareness of childhood cancer and the fight for research and a cure. As you know, our community embraces the spirit of giving during the December holidays yet donations of toys and playroom supplies tend to taper off significantly in the deep of winter – but not anymore. 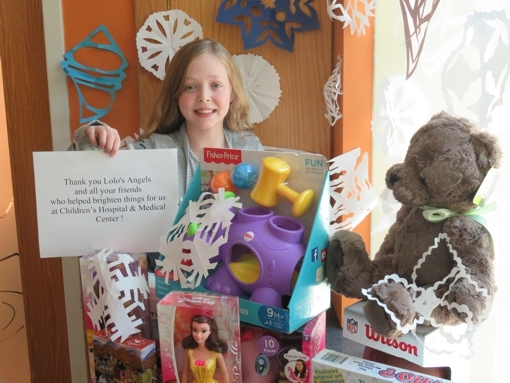 The gifts and supplies provided by Lolo’s Angels toy drive brought a smile to everyone’s face – including Madeline who, as you can see in the photos, is thrilled by the bounty and the flurry of handmade snowflakes. It is with deep appreciation that we thank Lolo’s Angels – from its board members to the volunteers – for all the time, effort and energy that goes into achieving your mission!